Well, it’s official. Fall is finally here. So, in true food blogger fashion I wanted to celebrate by sharing my first pumpkin recipe with you guys for the year! I came across these Caramel Pumpkin Blondies on Pinterest a couple weeks ago, and pretty much had to have them going into my mouth immediately once I saw them. A basic blondie batter is loaded with pumpkin puree, then studded with white chocolate, dark chocolate, and toffee pieces. Then a swirl of caramel sauce is layered into the blondies before being baked to perfection. They turned out a little fluffier and more cake-like than most blondies I’ve had, but I think I liked it better. Dense and moist, yet light and fluffy too – this cake has all the flavors of fall that I adore. Cinnamon, pumpkin, cloves, nutmeg, caramel…what’s not to love? Do yourself a favor and make these soon. I can’t think of a more perfect way to welcome autumn into our kitchens! Preheat the oven to 350°F. Line a 9×13-inch baking dish with aluminum foil and spray with non-stick cooking or baking spray. Set aside. Combine the flour, cinnamon, baking soda, salt, nutmeg and cloves in a medium bowl. In a large bowl, combine the butter, brown sugar and granulated sugar. Stir in the egg and vanilla, then add in the pumpkin. Add in the dry ingredients and stir just until combined. Add the white chocolate chips, semi-sweet chocolate chips and toffee pieces, mixing to combine. Pour about 2/3 of the mixture into the prepared pan, using a spatula to spread the mixture to the edges. Bake in the preheated oven for 10 minutes. After the blondies have baked for 10 minutes, remove and carefully pour the caramel sauce over the top. Take the remaining dough and drop by spoonfuls over the top of the caramel. Return the pan to the oven and let bake an additional 30 minutes, or until cooked through. These blondes look delicious! Your description of them and the combination of flavor a has my mouth watering! 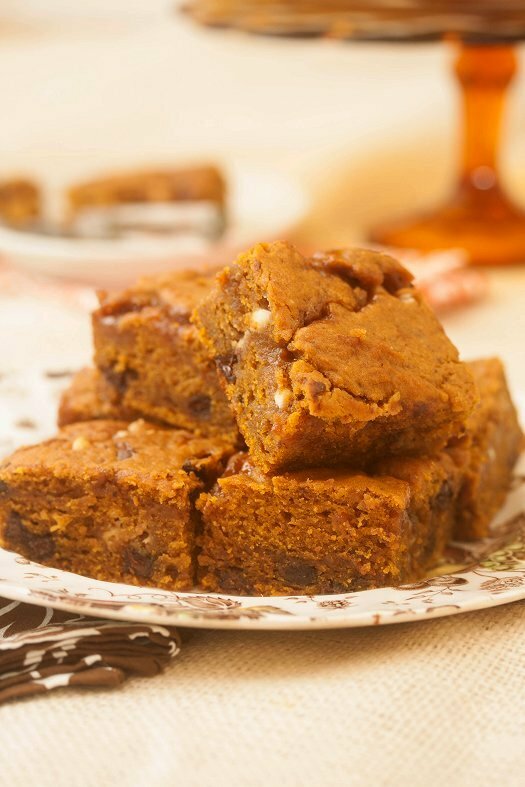 Hum… I adore your pumpkin blondies! The texture is so perfectly moist! I made some pumpkin blondies years ago and they were cakier (definitely not a word) than regular blondies, too. The dang pumpkin just messes up everything! Anyway, these look amazing and I totally want one. Cakey or not. When I get a minute (my new mantra), I am going to cook everything on your blog (as Julie and Julia only Jenny and Laura.). I will have to break order and start with caramel sauce followed by these. Goodness! Oh my Heavens! These are positively decadent. I am sure I wouldn’t be able to just eat one!